ONE came to me, calling me out of the form in which I dwell, and showed me the sleeping Spheres. Now the object of this Messenger who had come to me was to make clear to me some of the hidden things: things hidden, I mean, from the eye of flesh, yet not lying so remote from our ken if we only make some mental effort toward seeing. And the further idea appeared to be that if I were to see them, as it were objectively, though with the astral organ of sight, I might be able to make this, the Devachanic State, clearer to the thought of some of my fellows. For the sleeping Spheres are Devachanic entities. In Devachan we are not yet united with the Unknown Source. Hence the need, on the part of the Ego, of form—or container—of some kind. I have chosen here, arbitrarily perhaps, the name of “Sphere” for this Devachanic form. These Spheres, than which there are none more beautiful, do not lie in any given place; they are self-contained; they have condition, but no place. When I asked my Companion how this could really be so, he pointed out to me that they interpenetrated many other states of matter, cohering by means of their own vibration, just as do all other forms, of whatever kind and how­ever ethereal, throughout the whole of Nature. Imagine, then, that I saw these radiant shapes, now silvery, with a bluish frost upon them, now blooming into tints so translucent that the eye of the soul alone could perceive them, and that every tint was a Thought, an experience. These fair Thoughts were the dreams of the souls disengaged from earth. Dreaming thus, the Spheres slept. How blissful the dreams! For those colors were both living Light and Intelligence; each color was Thought; Thought of the most exalted order known to the human Mind. Thought quivered through the Spheres, changing their Consciousness; fusing them anew; quickening their higher Life; illumining their purer Light, in a world-plane whereon Light, Life, and Thought are one magnificent act of Being, and not the trivial things known to most men in this everyday world. Each Sphere thus became more and more incandescent with this three-fold life, and I saw them blooming and growing, through this sweet iris-hued ebb and flow, as a flower unfolds towards greater perfection by means of assimilated sun-light. The unfoldment was divine, the peace profound. Silence, like a brooding mother, covered them over; it was only enhanced by an occasional soft semi-tone, the harmonious breathing of the sleeping Spheres. Would that I need say no more! Yet even while I watched their gracious Being, it became plain that, like flowers, they must fade. Although they were composed of atoms of living Light, Light that was itself a grand Consciousness, yet I soon observed a marked change to take place and to become prevalent in all of them. This change was at first exceeding beautiful, and consisted of a slight rhythmic motion in the atoms of a Sphere. The atoms danced; living opals shot through with tenderest Light. Seeing this, I could but ask myself, “What new Thoughts are in the dreams of the Spheres?” This motion was soon imparted to the Spheres themselves. They trembled into corruscations (sparkles) of Light and grandly awoke. From them, thus swaying, issued glories that no tongue may name, nor do words contain them. Each Sphere thus joining the choral dance emitted a choral song; music whose ordained instrument is the naked soul; music that is visible flames of sweetest, intensest desire. All my being awoke into delicious longings in which reverence had no place. I said to my Companion: “What is the burden of this bewitching song?” Very gravely he replied: “It sings of the Life of the world”. I wondered to hear him speak so solemnly of what gave me so great delight, but when I turned again to the Spheres I felt a new perplexity. The accelerated motion had produced colors more vivid, more of the gross and solid nature of earthy pigment; the music now shrilled across the etheric spaces; there was in it the strident note of crass emerald, the bugle blare of blazing crimson. The Spheres would sleep no more. Yet I saddened now at their brilliant awakening; in my inner heart a deep voice said: “This is the end of all desire”. My Companion answered: “That is in truth what thou hast witnessed. A death to Devachanic existence, a birth into the material Life which thou and thy blinded fellows call ‘the world’. The form whose birth thou hast seen is but the model of the earthly one which it informs. It is thy lot to know more of this matter of so-called Life and Death. Another time I will again meet thee; thou shalt then undergo some experience of Devachanic Life.” He disappeared, leaving me in my ethereal body, adrift upon the night. Part II was never published during the time that the Path was edited by William Q Judge. A version claimed to be Part II was later discovered and published in The Canadian Theosophist in 1953. This is available on the Swedish Malmo ULT’s site. 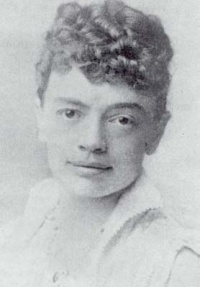 “Jasper Niemand” was the pen name of Julia Wharton Lewis Campbell. She is also known as Julia Ver Plank after marrying Philip Ver Planck, who died after five years of their marriage in 1876. She later married Dr Archibald Keightley. Julia Campbell was a disciple of William Judge and the recipient of many of his letters, some of which are published in Letters That Have Helped Me. She later became a well-known writer and dramatist.